Three RC4 LumenDimIO transceivers for wireless DMX cable replacement and data distribution. Each device can transmit or receive, with LumenRadio CRMX inside. Works with all CRMX-compatible devices and systems from any brand. 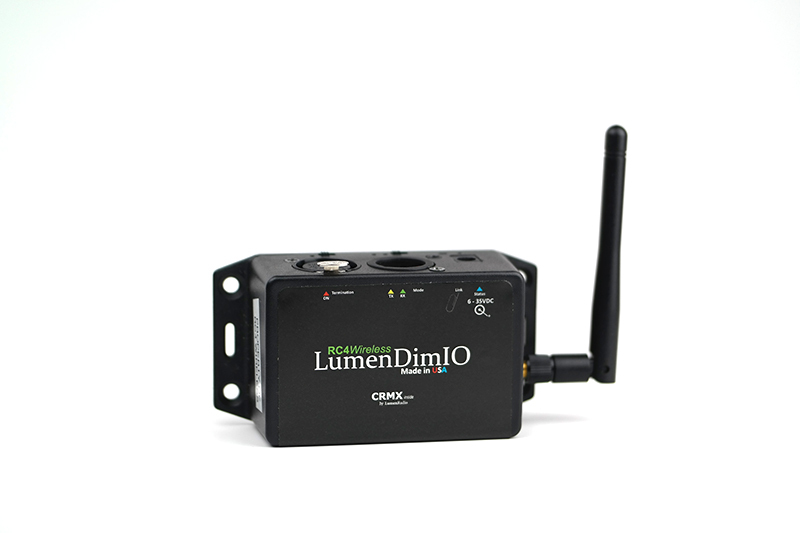 The RC4 Wireless LumenDimIO is a compact transceiver that combines selected RC4 features and the LumenRadio CRMX platform. 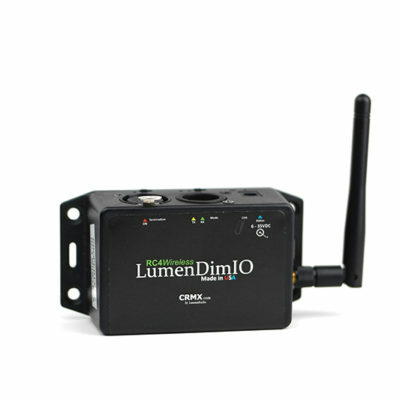 Any number of LumenDimIO units can be used together to build a large CRMX wireless DMX network. 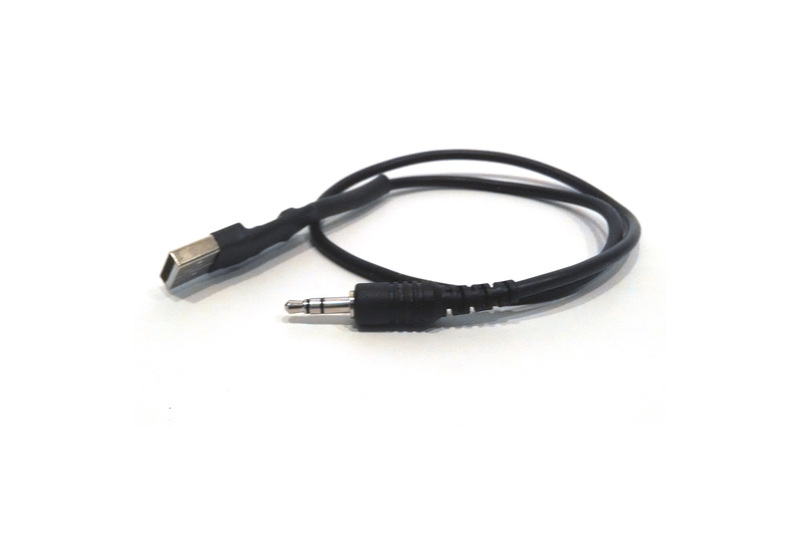 Firmware updates for new, free features are easily installed with this interface cable. 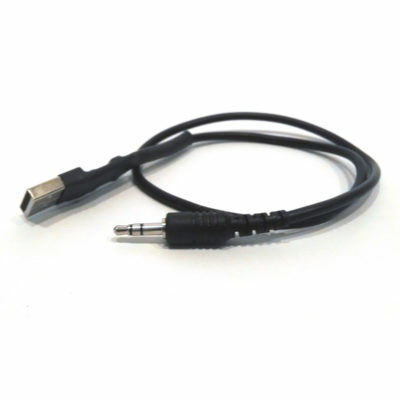 The RC4 CodeLoader Cable provides USB connectivity for firmware updating for all RC4 Series 3 devices released after April 2014, including RC4Magic Series 3, RC4 LumenDim, and RC4 W-DIM devices. Starting a new DMX wireless system with three (3) RC4 LumenDimIO transceivers is an affordable, easy way to free your production from endless feet of DMX cable! 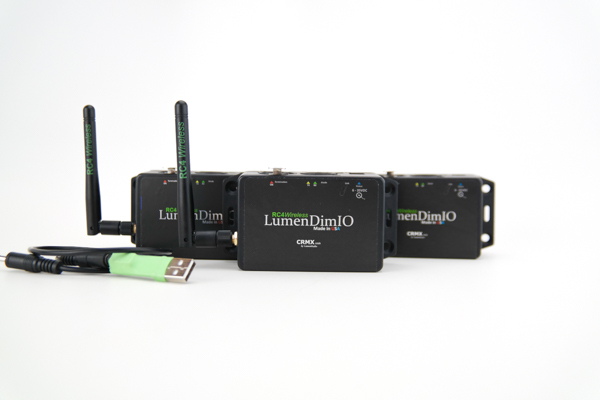 Three (3) RC4 LumenRadio CRMX compatible LumenDimIO transceivers. A favorite in both the film and tv industry, the RC4 LumenDimIO transceiver can work as either a transmitter or a receiver. They can be networked together to create an extended wireless DMX network, keeping cables out of sight lines and eliminating tripping hazards . The RC4 LumenDimIO typically works reliably up to 200′ (60m). Line-of-sight is not generally required, but dense objects between units — like concrete walls — will attenuate the radio signal and reduce the available range. *RC4 LumenDim Starter Kits are intended only for new customers or new projects. To add additional RC4 LumenDim components to your existing system or to a Starter Kit you are purchasing now, add individual pieces to your shopping cart.